Or should I say “seashore”? I have a wedding to perform at Ocean Isle Beach on Friday, so we took this week as a vacation. We are spending the week in North Myrtle Beach, SC. One of the highlights of the week is the fact that our grandson Clayton is with us. This is his first time at the beach, err seashore. Anyway, he saw the ocean for the first time today and he was not pleased with what he saw and experienced. He did not like the water moving like that. He said that the ocean was “Too big” and he wanted nothing to do with it. 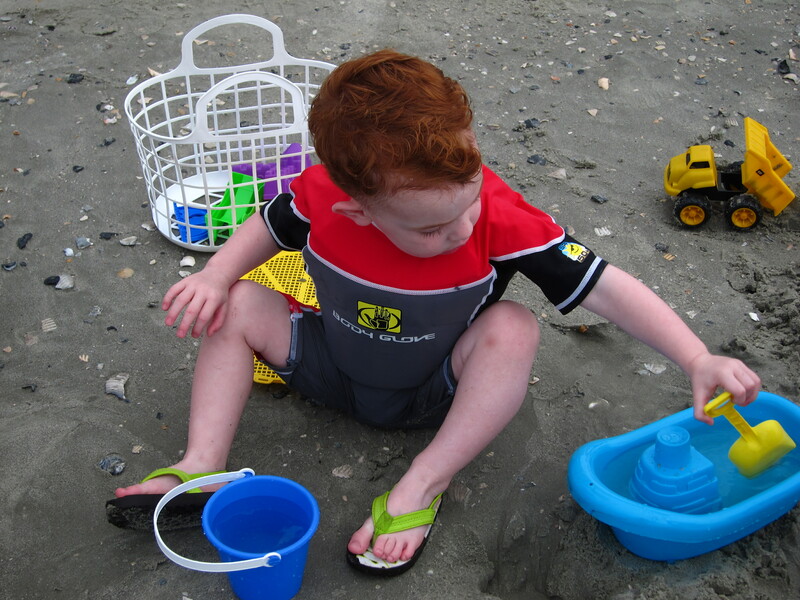 He stayed a respectful 10 feet away from the water and played with his trucks in the “dirt sand”. We were there at high tide and will try it again tomorrow at low tide. That should make a little difference in how he feels about things. Well, I’m going to sign off and go vacate some more. It’s hard work, but somebody’s got to do it. It might as well be me! Here’s a shot of Master Clayton in his Bodyglove ensemble. This is an exciting week for us here ate Calvary. It is time for our annual Vacation Bible School. As I sit here in my office, dozens of children have gathered at the church to learn more about Jesus, make a craft and have a good time. Pray for our VBS this year. Pray that God will convict the hearts of some children and save some for His glory. The Lord met with us this morning at Calvary Baptist. He moved among His people, calling many to Him for help and encouragement. He even saved a young man at the end of the service. That young man stood up and told me that he had gone to some church back in October and he went tot he altar led him through one of those 1, 2, 3 repeat after me deals and the boy thought he was saved. He told me that it was in his head, but that today, the Lord had gripped his heart. When he came today, he was under conviction and ready to surrender to the Lord. It was a great morning and I look forward to what He has for us tonight! The tent meeting with Willowdale Baptist Church in Vilas, NC finished on a very high note. The Lord moved in the service and arrested the heart of a young woman and saved her by His marvelous grace. This lady came out of a Roman Catholic background. Some time ago she made a profession, but Friday night she saw for the firs time that she was a sinner in need of a Savior. She saw that she was a tare and not fruitful wheat. She saw that she was a goat and not a sheep. God broke her during the service and she came to Jesus under Holy Ghost conviction. I praise His name for that! During the course of the message I made a statement that many people will find objectionable. (That’s nothing new!) I said that decision oriented preaching has done more to fill our churches with goats than anything else. I said that our insistence on people praying a certain prayer and following a prescribed formula has led many to be deceived about their salvation. I just believe that salvation is a sovereign work of God in a lost heart. Surely the lost sinner has to believe the Gospel, but there is not scripted method in the Bible for doing that. Many would hold up the prayer prayed by the publican in our Lord’s parable in Luke 18, where the lost man said, “Lord, be merciful to me a sinner”, as the prayer everyone has to pray. Of course, if you read the conversion accounts in the book of Acts, that theory falls apart quickly. When Paul was saved, the Lord struck him down and Paul’s response was to say “Lord, what wilt thou have me do?” If you look at how the disciples were saved, the belief that you have to follow some sort of script will not hold water. Take Matthew for instance. Jesus called him while he was collecting taxes for Rome. Matthew simply got up and followed Jesus. There was no prayer and no one led him down the Roman Road. Now, I am not against people praying some prayer, but when we say that lost sinners must come to Jesus in a certain way, following a pattern we lay down, I do have problems with that. And, I think the Lord might have problems with it too! You see, salvation is of the Lord, and does not come to us because we follow some man made formula. Salvation comes when a lost sinner under Holy Ghost conviction looks in faith to the finished work of Jesus Christ at Calvary and the empty tomb as the sole basis of salvation. It might not even involve a prayer, it might be a transaction in the heart between the sinner and God. Of course, there will be fruit when a person comes to Jesus and is truly saved. No fruit in a life equals no root, no matter how many times a sinner prays any prayer. So, instead of calling people to make a decision for Jesus, maybe we should be simply preaching the Gospel and trusting the Holy Ghost to draw them as He sees fit. If you do what I tell you, you have no guarantees that you will be saved. But, if you do what He tells you, it will work every time! What does He say, “That if thou shalt confess with thy mouth the Lord Jesus, and shalt believe in thine heart that God hath raised him from the dead, thou shalt be saved.” (Rom 10:9 KJV) It’s as simple as that! I believe the Bible teaches us that salvation is by grace alone, through faith alone, in Christ alone! Thank God for that! Have a good day in the Lord’s house today. Preach His Word in power preacher and trust Him to do His work in the hearts of His people! Lord willing, we will finish our tent meeting tonight in Vilas, NC. The meeting has been a real blessing this week. God is help to submit with us each night in a very special way. I have experienced great liberty as I preach the Word, and the people have responded to God’s call at the end of the sermon. The only thing that would ice the cake for me would be for someone to be saved to night. Please pray for the meeting, and for brother Eugene Braswell, our moderator. I preach this same meeting last year. By virtue of it being a tent meeting, it is obviously outside. I suffer from seasonal allergies in the springtime, and last year I became very sick after preaching outside all week. I then followed that meeting with two more weeks of meeting, and by the time it was all over, I was very sick. I learned my lesson this year! Instead of making the hour drive back home in wet clothing, I’ve been changing each night just after I finish preaching. It has made a significant difference. Some things you know to do, but you just have to learn the hard way. I have discovered however, that lessons learned in this manner are not soon forgotten. Thanks again for your prayers, for your support of The Sermon Notebook, and for your readership of this blog. God bless you all, and especially you preachers, who will open the Word of God and preach the Gospel to God’s glorious church on the Lord’s Day. I am preaching this week in a tent meeting in Vilas, NC. The meeting is being sponsored by Willowdale Baptist Church. The pastor of Willowdale Baptist is Brother Eugene Braswell. Thus far, the meeting has been well attended, and there has been great liberty to preach the word of God. Last night the weather refused to cooperate, so the service had been moved to the sanctuary of Willowdale Baptist Church. The meeting will continue through Friday, under the tent, Lord willing. Please pray for the meeting, and come be with us if you can. I look forward to going back up the mountain tonight to see what the Lord is going to do in the service. On another note, I have been having difficulty persuading myself to blog. It appears that I’ve run out of ideas, and I’m somewhat loathe to talk about my personal life, or the mundane details of my day-to-day ministry. So, help me pray that the Lord will give me direction for this blog. I would also mention, at the Burke County Camp-meeting is underway. The meeting will continue through next Wednesday. Brother Tony Finney from Conastee, SC is preaching through Thursday. Brother Tony Land will be preaching Friday through Sunday. Brother Rick Safriet will close at the meeting next week. Also, the Taylorsville Baptist Campmeeting will begin this coming Sunday and will continue for the next two weeks, with morning and evening services. You would do well to avail yourself of the opportunity to worship God in these old-fashioned camp-meetings.